You know what I like about Steven Seagal? He isn’t afraid to go anywhere in the world to knock the crap out of some scuzz who’s up to no good. He went to Montana to fight an evil militia in The Patriot. He hung out in L.A. to thump some greasy Chechens in Black Dawn. And he even went to Uruguay to thwart a mind control scheme in Submerged. Uruguay? I didn’t even know there was such a place until I saw Seagal hijacking one of their submarines! The climatic sword fight though is only one of many memorable moments in a movie that punches all the right Seagal-Straight-to-Video buttons. Puffed up action hero? Check. Lots of people getting shot? Check. Poorly shot tae kwan fu fights? Double check! Seagal playing a former CIA employee (his old Company ID actually identified it as something called the CSA, but you know how tricky those black ops types are)? Mega check! All the pieces for 90 minutes of Seagal wandering slowly around various locations, squinting, frowning, and occasionally shooting a guy fifty times are in place! All that remains are the tasty details to flesh out the action. And the details this time around are simply delicious! 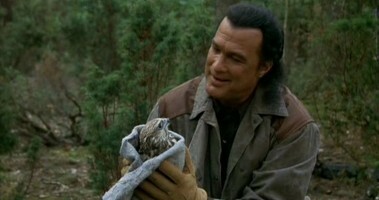 The opening scene shows Seagal hanging out in a forest rescuing some kind of bird from a trap and nursing it back to health! As nifty as helping out his forest friends is, you can’t very well build up a lot of drama by having him fly to Poland to rescue a raccoon from terrorists, can you? This is where Seagal’s pen pal comes into play. Pen pal? What, you don’t think that a guy who used to do a lot of dirty work for the Company can’t try to find a little peace by doing something good for someone else? And who better (and more sympathetic) than a Polish orphan girl with a better command of the English language and the written word than Seagal himself? The letters between these two are read to us by having each character do some voice overs. The interesting thing about this is that when Seagal is silently reading the letters and we hear the voice in his head reading them, it’s not his voice! Some other dude’s voice has been dubbed in instead of Steve’s! A more risky move creatively speaking was when once in awhile during the film, Seagal would suddenly start speaking in another voice out loud to other characters! Some may complain that Seagal was too lazy to go back and do some redubbing, but I like to think it was part of his covert operation training that allowed him to switch between different voices as a way to maintain his cover and confound his foes. Seagal’s pen pal goes and gets herself kidnapped by some dirtbags intent on selling her and some of her orphan buddies to the highest bidder. Right about this time, Seagal’s log cabin is invaded by his former employers from the Company and they try to take him into custody! Seagal breaks a few elbows and goes deep undercover as a French-Canadian (I think) guy long enough to get a suspicious letter from the orphanage stating that his pen pal can’t write to him anymore. Steve heads to Poland to investigate and follows one vague clue after another and closes in on the kidnappers while getting help from a lady cop and a orphan boy who was friends with Seagal’s pen pal. But if you only woke up for that, you would have missed the cat and mouse game Seagal engaged the bad guys with at…the Turkish Embassy Ball! This gala social event of the season was no doubt highlighted by the coded message that Seagal’s pen pal left him on a tray of hors d’oeuvres! The sword fight at the conclusion of the film follows a brief hand-to-hand fight that sees Seagal get elbowed in the gut a few times which causes him to momentarily stagger and the camera to briefly shift in and out of focus. Not to worry though because Seagal catches his breath (they probably had to film that scene the next day) grabs a sword and heads off to his showdown which ends with Seagal slicing a guy to death while his pen pal watches in stunned silence. Just for good measure, Seagal maintains a dramatic post-slicing samurai pose for a really long time. Director Po-Chih Leong knows that a good finish will often times refer back to a film’s beginning, thus we are treated to a postcard update to Poland from the orphans to the lady cop stating that they are living with Steve and having fun. They go on to say that Steve spends most of his time alone in the forest rescuing injured animals. 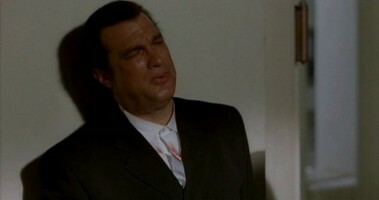 Then movie then closes with a still shot of Seagal’s jowly face superimposed with an image of a bird that he rescued. Admit it – you wish you were Seagal. But without the gut. And without that weird voice in his head that reads his letters for him.